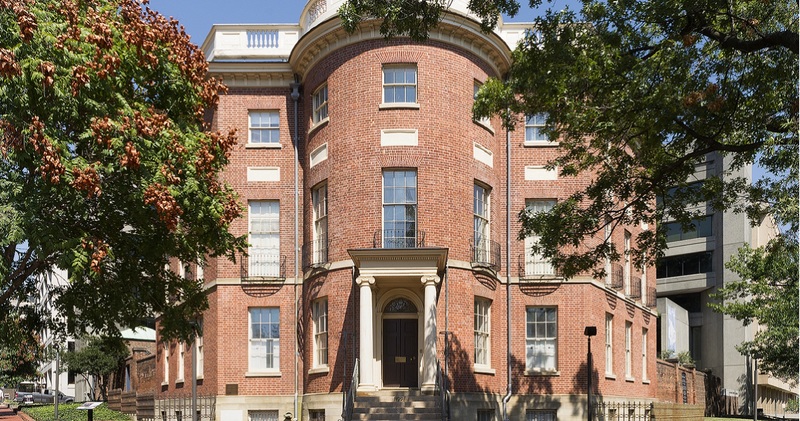 A short block from the White House stands the Octagon, a National Historic treasure. One of the first great homes built in the new nation’s capital, the Octagon is a landmark of America’s architectural, political, and cultural history. Completed in 1801 for the eminent Tayloe family and designed by William Thornton, the original architect of the U.S. Capitol, the Octagon is one of the most significant and elegant buildings to remain standing from the early federal city. It was in the upstairs parlor that President Madison signed the Treaty of Ghent on February 17, 1815 establishing peace with Great Britain. In 1899, The American Institute of Architects chose the severely deteriorated building as its new national headquarters, initiating a series of state-of-the-art restorations. After over two centuries of use, adaptation, renovation, and restoration, the Octagon continues to serve as a reminder of the great beauty of early American design and the lasting value of architectural excellence. The Octagon House is open Thursday through Saturday from 1:00 to 4:00 PM. Admission to the Octagon Museum is free. Private guided tours are available by appointment. Tours last approximately 45 minutes, and are $10/adults and $5/students (discounts available for groups of 10+). Due to staffing limitation, we ask for at least 24 hour notice when scheduling a tour. Schedule a guided tour at [email protected] or 202-626-7439. Self-guided and guided tours of the Octagon Museum are available. Private guided tours are available by appointment for groups of 5 or more. Tours last approximately 45 minutes, and are $10/adults and $5/students (discounts available for groups of 10+). We ask for at least 24 hour notice when scheduling a tour. Guided tours are only available outside of regular open hours. Metered street parking is available on the streets surrounding the Octagon, and parking garages are also available, though many are closed on the weekends. The Octagon does not have any dedicated site parking, due to our location in downtown Washington, DC. The Octagon House, as it came to be known, was completed in 1801 in the very early days of the new federal city. Constructed for John Tayloe III and his wife Ann Ogle Tayloe, and designed by Dr. William Thornton—the first architect of the Capitol—the house was a prominent statement of support for the new capital city from one of Virginia’s most prominent families. The house served as an important social center in Washington’s early years, and when the British burned the White House in 1814, President Madison and his family lived in the Octagon for six months as the city rebuilt. It was here that President Madison signed the Treaty of Ghent in February 1815, formally ending the War of 1812 between Great Britain and the United States. The Tayloe family lived in the house until Anne’s death in 1855. By that time, the neighborhood around the house had changed significantly as factories and breweries filled the Foggy Bottom waterfront. After Anne’s death, her sons rented the house, first to a Catholic girls school, and later to the federal government for office space. By the 1880s, the building housed numerous poor families as a tenement. Around that same time, the American Institute of Architects, which had been headquartered in New York City, began looking for a new national headquarters location in Washington, DC. In 1898, the AIA rented the Octagon, and the organization purchased the building in 1902. Major restoration efforts were undertaken in the 1960s and the 1990s, which returned the Octagon to its Tayloe-era appearance. Currently operated by the American Institute of Architects Foundation, the Octagon Museum offers self-guided tours, permanent and changing exhibitions, public programing, and guided tours by appointment.